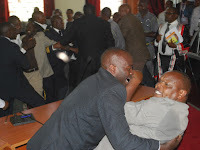 Saturday September 15, 2018 - Detectives from the Criminal investigations Department arrested Nakuru County Deputy Speaker, Samuel Tonui, on Friday in connection with ongoing tribal clashes in Njoro, Nakuru County, that has left 5 people dead. Tonui was arrested together with a former MCA for fanning violence between the Ogiek and Kipsigis communities. Following Tonui’s arrest, over 25 MCAs converged at Njoro Police Station on Saturday in a show of solidarity with the Nessuit MCA. The MCAs led by Majority Leader Stanley Karanja want him freed until the investigations are concluded. “He has a health problem and needs medical attention," Karanja said on Saturday. He emphasised the role of leaders in efforts for sustainable peace and noted the need for them to be protected, not victimized.